ShareFest 2019 - Oxford, Ohio | Donate. Volunteer. Help people in need. Donate. Volunteer. Help people in need. ShareFest 2019 will be held Wednesday May 15th thru Tuesday May 21st. 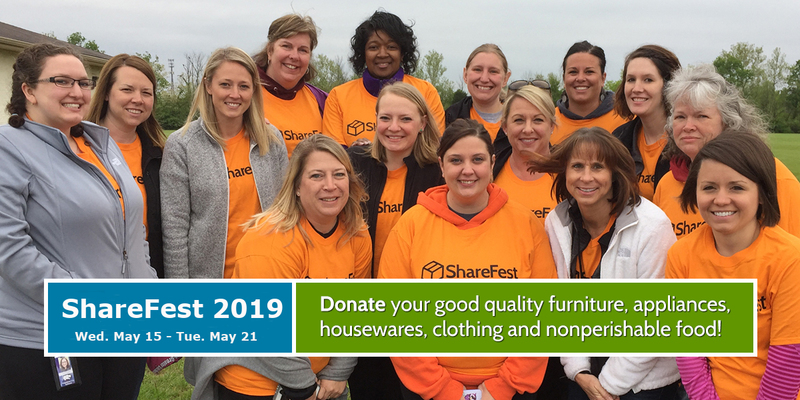 ShareFest is a service and environmental nonprofit corporation dedicated to the collection and redistribution of items donated by Miami University students and the Oxford community at the end of the academic year. Collected items benefit residents in need and social service agencies throughout the region. What happens to my donations? The non-profit and governmental social service agencies participating in ShareFest may give donations to people in need, or sell items. All proceeds from the sale of ShareFest donations must benefit the agency and its clients. Furniture, appliances, housewares, clothing, and food. We need drivers and lifters to pick up donations from on- and off-campus. Found out about the groups that receive ShareFest donations.